Succulents, particularly one type as a cactus plant, are cute though many are prickly, especially the Prickly Pear cacti. They’re the perfect household plant for anyone who has a less-than-average green thumb. Succulent plants require minimal watering, allowing you to easily decorate your home with fresh air and greenery without the worry of killing poor Prickly Pete. 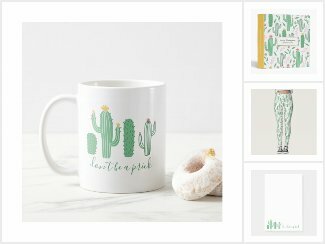 If you don’t want to take your chances on the possibility of killing Prickly Pete, then you can show your love for your favorite desert succulent plant with one of our cute cactus designs. They won’t even prick your skin, making our cacti more huggable and loveable.